In the U.S., many credit card machines at places like gas stations have started asking for your ZIP (postal) code to use a credit card ostensibly to help verify that you really are the cardholder, rather than the card being stolen. My question is simply: Is there any evidence that this actually leads to a significant reduction in successful credit card fraud? It seems to me like this would not be a very useful measure for a machine that requires the card to be present anyway. I would have guessed that the most common way someone would physically end up with your credit card would be if they stole your wallet, in which case they almost certainly have at least one and likely several IDs that include your ZIP code. For example, in my wallet, at the very least, my driver's license, car insurance card, business card, and pilot certificate all have my zip code listed and it would also be trivial to figure out from my voter registration card. Thus, I'm curious if any actual security benefit has been shown for this or not. 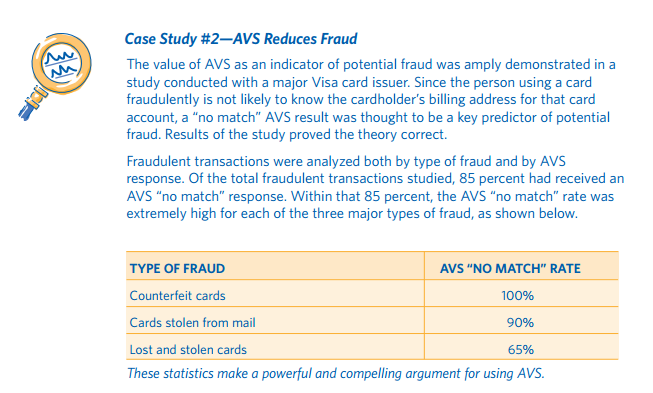 Is there any evidence that this actually leads to a significant reduction in successful credit card fraud? The fraud prevention feature you are referring to is called Address Verification Service (AVS). 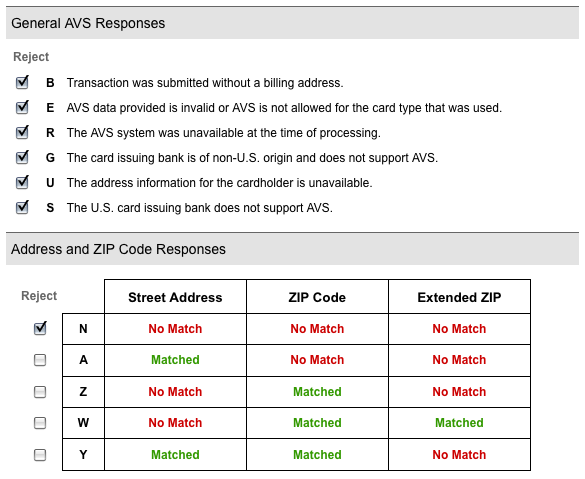 AVS service checks that the street number and/or the zip code presented at the terminal match the data present for the card holder at the issuing bank. In real-time, the payment processor will return an AVS Response. Based on the response, the merchant can decide to reject a non-conforming transaction. It has been adopted by nearly every card issuer in the US. In a gas station terminal setting, the terminal might be set to reject AVS Response codes N and A, for example. You bring up a good point that's often overlooked in Security. Data. I think it's unlikely you're going to find actual data for the effectiveness of a security policy. I don't know of a lot of actual scientific analysis in the security industry, and that's a terrible shame. So people are left to speculate, and speculate they will. Like gowenfawr, I don't have any data either, and can only offer speculation. You're right that the "stolen wallet attack" won't offer any protection from fraud. But a lot of credit cards these days are stolen from insecure automated processing systems. Target and Home Depot are examples of this. Attackers are taking the information from these systems and cloning cards. I don't believe these systems generally contain the zip code of the cardholder, and it's not encoded on the card itself. The point being, asking for a zip code at a gas station will make cloning attempts harder to perform. I'd speculate that this will reduce fraud by some amount. It's for deterrence, and some things that are used for deterrence are really for the customer to feel safe and secure and do very little for "security." Take surveillance cameras. I probably install about 200+ cameras a year, and as I do everything possible to make the cameras protect the site as best as I can, there are ways around that. They are for deterrence. People see cameras and go "Oh they have cameras, I can't rob this place." Not saying cameras are useless, I've help store owners capture probably about 50 employees/customers stealing over the years. So, let's start with this example. I've stolen your wallet, now whether you realized this happen 5 minutes ago or 5 hours ago you are going to call your banks/credit card and cancel your cards. As the thief I have to use your cards quickly as I know your going to cancel your cards. I'd be more worried about identity theft from a stolen wallet instead of my cards being used. You are right, if I have your wallet I know your zip code. Maybe I can't use your business card, but I can still get away with something for free. I'll go buy pre-paid cards to use and trash your wallet maybe keeping your ID cards. Let's say instead of stealing your wallet, I hack a POS network and get card information from there. I don't have your zip code, but I could still make a duplicate copy of your card if I got enough information from the hacking I did at the POS network. You wouldn't know your card information had been compromised until the company releases that they've been hacked. Still I could still use that card data to buy stuff, but not at a "pay at the pump" type setting. You are asked for the ZIP code at locations where you aren't "interacting" with a person. It's a prevention method to keep thieves with your CC info from stealing gas. However they could go inside with a "copied" card and buy gas inside. Simply, if you are paying with a card 'face to face' with someone, they don't need any extra information from you besides what's on the card. They may ask for Photo-ID to confirm you are the card holder. If you are at kiosk paying station (gas pump, store kiosk) and the system asks you for the zip code of the billing address of the card, it's to check for fraud. That zip code check, is verified by the card-holder's bank and is not used in any way other than to verify the information is correct. In a 'face to face' any extra information they ask, is most likely for marketing purposes and they cannot deny your transaction by you failing to give that extra information out. California Beverly Credit Card Act of 1971 deals with that, and amendments have been made to it over the years. Does it cut down on fraud, maybe. However, I could still go inside with "your" card and buy gas there. Granted, there's more chance of failure going inside. Cameras, cashier asking for ID, card being reported stolen. Your card was declined, see attendant. If I got option #2, I would just leave and try another zip code at another gas station. You would have to ask one of the gas companies, or one of the fraud providers (like Accertify? ThreatMetrix?) who might have statistics ("evidence"). It seems to me like this would not be a very useful measure for a machine that requires the card to be present anyway.... [thieves] almost certainly have at least one and likely several IDs that include your ZIP code.... Thus, I'm curious if any actual security benefit has been shown for this or not. Of all anti-fraud information tidbits, the zip code is the only one that can be conveniently entered on a numeric-only gas pump keyboard. Requiring a zip as anti-fraud serves as notification to the user that this transaction is being scrutinized, which may have both a reassuring effect on valid users and a deterrent impact on fraudulent users. Doing something ends up being better than doing nothing in this case. There are other fraud steps - location, frequency, and habit analysis - which are probably more effective against the "stolen wallet" use case. But those happen behind the scenes, with no reassurance or deterrence. Another reason would be to cause the person entering the information to be delayed slightly. Anything that adds a few seconds to an amateur thief's activities reduces the chances they will follow through. Also, those extra few seconds increase the chances of getting a good image on camera. Kinda like what Israel said, it can add somewhat of a delay but chances are that your security cams should already be able to pick it up. Chances are if they know your credit card info, they basically know everything else, probably just a minor protection method. Has the wedge security flaw been fixed for credit cards?